Komponist (1865-1931). 9 A.L.S. and 2 A.P.S Kopenhagen bzw. o. O. 20½ SS. Vorwiegend 8vo und 4to. Dänisch. To his student, the later composer, director, and organist Knud Harder (1885–1967), who tried to popularize Nielsen’s work in Germany. 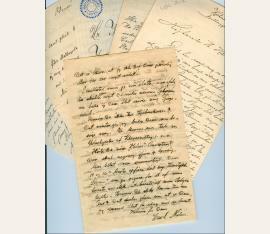 He wrote articles about Nielsen’s life and work in “Die Musik” (5/III, pp. 155–163). I. 3 May 1905: Nielsen encourages Harder to write an article about him in the periodical “Die Musik” zu schreiben. II. 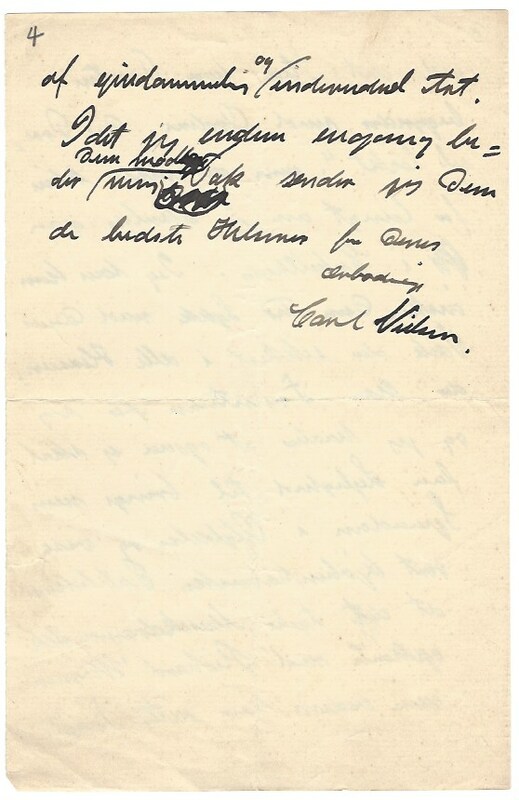 5 July 1905: Nielsen writes that he will unfortunately no longer be able to teach for free, but will charge him a reduced price of six crowns per hour. III. 7 June 1907: Nielsen reports about family trouble and his wife’s severe illness. The is grateful that Harder visited Schillings, but is uncertain which work to show to Schillings. His own suggestions are “Maskerade” [opera, 1904–06] and “Søvnen” [choral work, 1903–04]. IV. 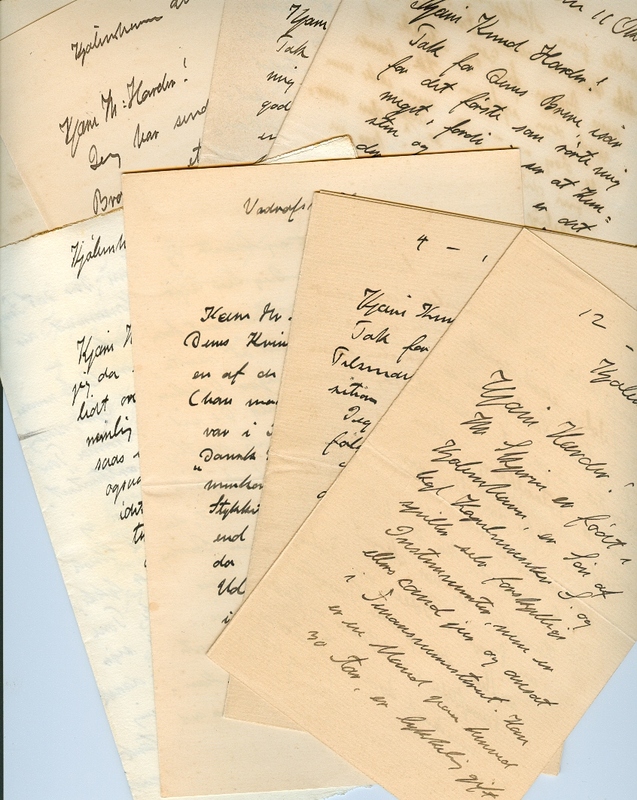 2 December 1907: Nielsen thanks Harder for trying to make his work known in Germany, although he is pessimistic because he is convinced that the Germans will consider his music too harsh, too tedious, and too uninteresting. 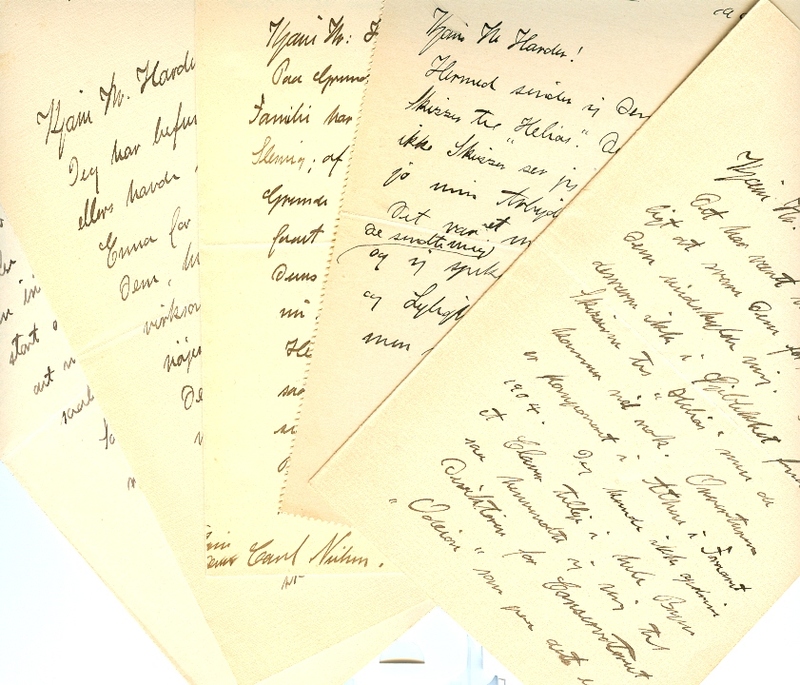 Nielsen requests Schilling’s address so that he can send him his “Symphonic Suite” and “Saul og David” (1898–1901). 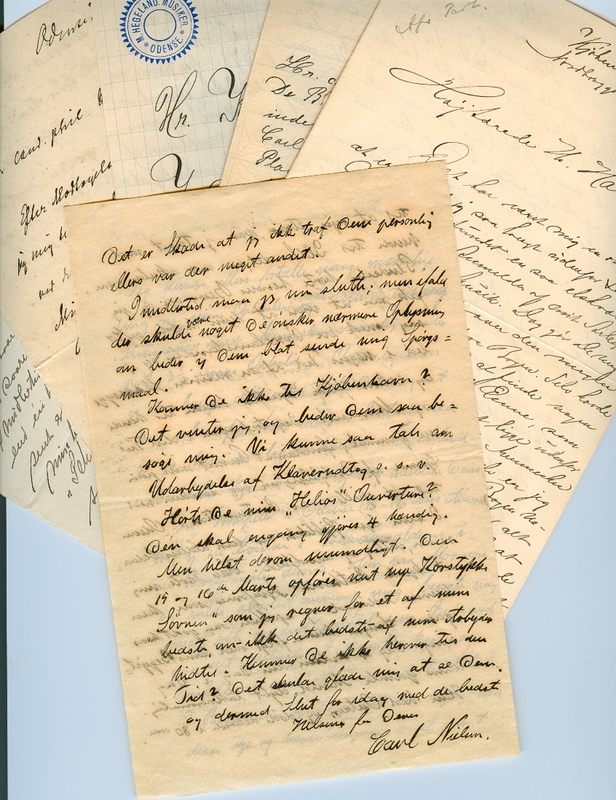 V. N. p. o. d.: Undated letter draft, possibly intended for translation, to Max von Schillings and refers to the “youthful and genial” string quartet sent by Schillings and to his beautiful songs, which Nielsen has already studied. He is enthusiastic about Schillings’s musical tragedy “Moloch” (completed in 1906), beside which all other works pale. He praises its structure, severity and earnestness. He adds that he hopes the Copenhagen audience will be able to enjoy this work; he has noticed that German musical drama has not ended with Richard Wagner. – Partly published in “Carl Nielsens Breve”, Gylderdal, 1954. 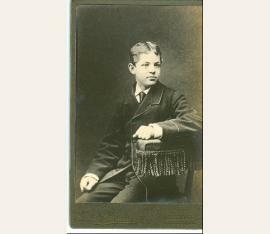 – Includes: studio photograph of Nielsen (half-length portrait in semi-profile, facing left, 10.5 x 16.5 cm. By Fred Riise, Copenhagen, c. 1909. – Nielsen wrote his first symphony in 1892. In 1902, Nielsen made his debut as a conductor at the premiere of his opera “Saul and David”. The same year saw the prodcution of his second symphony, “The Four Temperaments”. In 1905 Nielsen resigned as a violinist, but kept working at the Royal Theater as a conductor from 1906 to 1914. His comic opera “Maskerade” premiered in 1906. However, Nielsen was not to find recognition abroad until 1912, the year of his violin concerto and his third symphony, “Sinfonia espansiva”, praised for its genius and explosive power (cf. MGG IX, 1516)..
Komponist (1865-1931). Autograph letter signed. Kopenhagen. 4 SS. auf Doppelblatt. Gr.-8vo. Dänisch. Mit einigen Beilagen (s. u.). 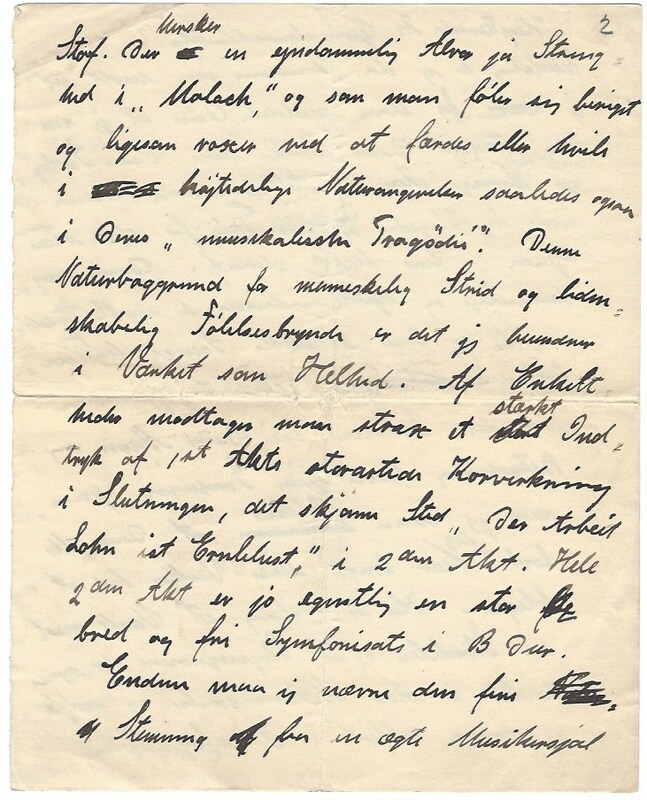 Interesting letter to his pupil, the later composer, conductor and organist Knud Harder (1885-1967), writing about his early years as a musician in Odense. 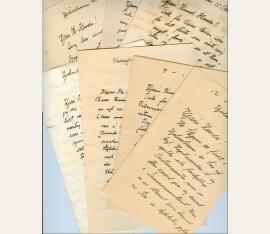 Accompanied by 6 letters from various addressers and Knut Harder, regarding the biography of Carl Nielsen. Komponist (1865-1931). Portraitphotographie mit eigenh. Zusatz. verso. O. O. u. D. 90:60 mm. Auf Trägerkarton. Carl August Nielsen (1865-1931), Komponist, Schüler von Gade, einer der bedeut. skandinavischen Komponisten nach E. Grieg. 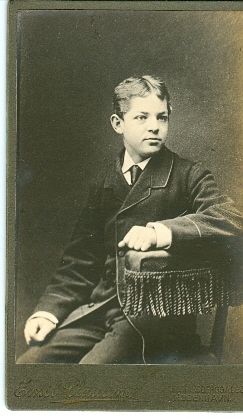 Porträtfotografie (carte-de-visite) m. e. Bezeichnung Nielsens auf der Rückseite „14 ar“ [14 Jahre], 6 x 9 cm. Komponist (1865-1931). 6 autograph letters signed. Kopenhagen und o. O. 18 SS. Gr.-8vo. Zumeist Doppelblätter. Dänisch. 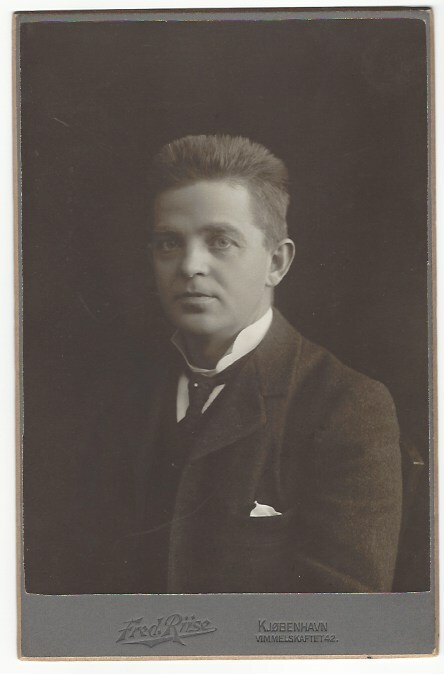 To his pupil, the later composer, conductor and organist Knud Harder (1885-1967). 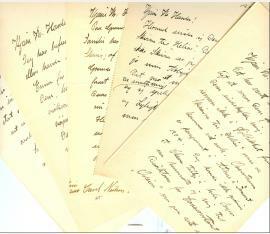 During the most productive part of his career (29.11.1905) he writes: „As you can imagine, I work a lot in recent times. I was involved with the performances of “Oluf” and “Maskerade” and partly with the ouverture of “Maskerade” […]”. Komponist (1865-1931). 8 autograph letters signed. Kopenhagen und o. O. 29 SS. Gr.-8vo. Zumeist Doppelblätter. Dänisch. 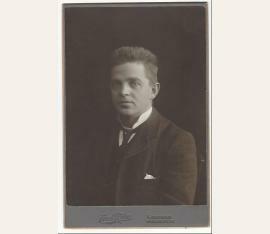 To his pupil Knud Harder (1885-1967), later composer, conductor and organist. 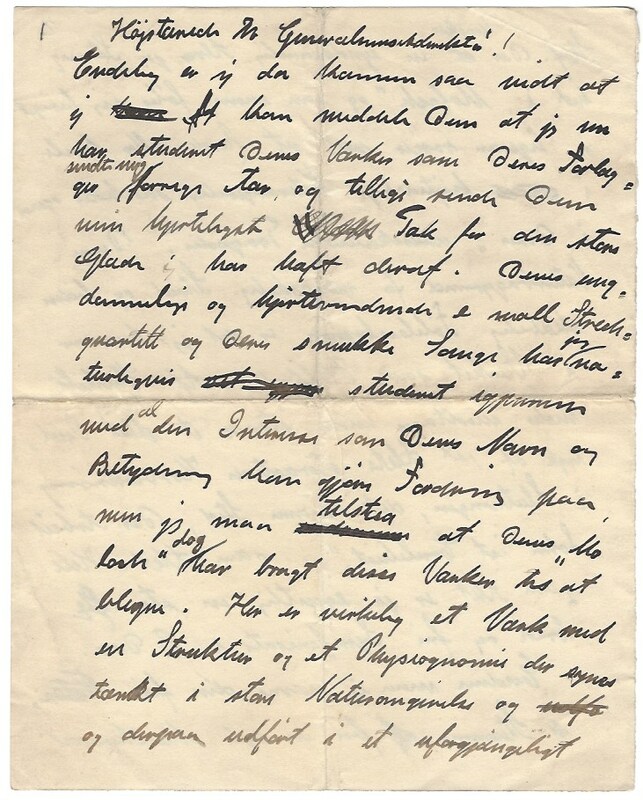 On 8 May, Nielsen writes enthusiastically about his wife, the sculptress Anne Marie Nielsen, who just won a competition for a statue of Christian IX of Denmark: “It will be the largest statue ever built in Denmark”.